The new special edition Souveran M815 Metal Striped series captivates a new level of sophistication. The combination of black resin married with palladium plated stripes, exude a new refined elegance. The shining silver stripes continue the iconic Pelikan striped design element typical of the Souveran pen series. The brass material used as base material for the barrel adds weight and a high quality feel to the fountain pen. The rings and the clip are palladium plated, and the 18k gold nib is plated in rhodium in order to obtain their silver finish. These differential piston fountain pens is be available from Penbox in nib grades extra fine, fine and medium. The special edition M815 comes in a specially designed gift box that reflects the striped design of the Souveran series from the 1930s. 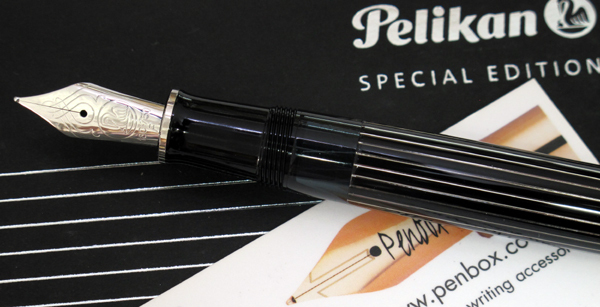 A special edition fountain pen for 2018 from Pelikan. Alternate silver and black resin striated barrel. Piston filling ink system using bottled inks. Large 18k gold nib with rhodium decoration. Viewing section to the barrel to check the ink level.